Chinese artist Song Dong opens Dad and Mom, Don’t Worry About Us, We Are All Well at Yerba Buena Center for the Arts a week from Friday, February 25th. The show features his mothers domestic odds and ends which she horded in the family's tiny Beijing house... Everything she had from clothes, books, kitchen utensils, toiletries, school supplies, shopping bags, rice bowls, dolls was collected and saved. 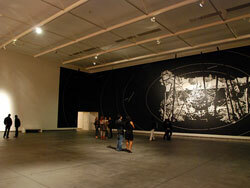 Her son Song Dong has traveled from museum to museum displaying them all like his 2009 show at NY MoMA (read a review). Waste Not follows the Chinese concept of wu jin qu yong or 'waste not,' as a prerequisite for survival. The project evolved out of a family necessity and the artist's mother's grief after the death of her husband. The assemblage of thousands and thousands of items takes up a 70 x 60 foot area that viewers can navigate around and through. The centerpiece of the installation is the architectural armature of the building where the artist was born. A core theme of Waste Not is the idea that people, everyday objects and personal stories are not only spiritually rich in thematic material but recognizable evidence of the impact of politics and history on family life. YBCA: YOU, A FREE, GROUNDBREAKING ADULT EDUCATION PROGRAM <-- wanna build up your visiual art appreciation and education? Yerba Buena Center for the Arts is starting a free 9 month program where up to 100 people will receieve free admission to all YBCA exhibtions and events. You'll receieve a supportive, dynamic setting for participants to deepen their connections to contemporary art, starting with refining their observational skills. No prior knowledge of contemporary art is necessary. --- basically it's like arts education for FREE... Sign up now for a shot. Deadline is Feb 28th.